Erika Rux (Librarian at Concordia College’s Ylvisaker Library) and I were able to attend the Internet Librarian 2009 Conference last week in balmy Monterey, California. 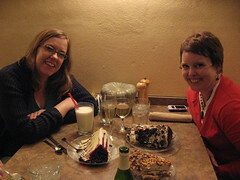 Pictured here are Brenda Hough and Erika having fabulous desserts after a long day of sessions! One of the hallmarks of IL is networking between attendees — a way to catch up with old friends, and to meet new people face-to-face. Old Monterey, on the bay, is a small town, so the conference flows easily from the conference center to the restaurants, pubs, and outdoor plazas of the area. For more information about the sessions — most of which were being streamed — go to the bloggers and presenters who captured the sessions and shared their slide-presentations. Bloggers to check include Sarah Houghton-Jan, Bobbi Newman, David Lee King, Matt Hamilton, Buffy Hamilton, Michael Porter, Jason Griffey, … and many more. On Twitter, check out the nearly 5000 tweets under #il2009. It is an exciting Conference and one I look forward to attending in the future. Along with Computers in Libraries (east coast; spring conference), Internet Librarian is one of the most stimulating and energizing conferences available! The Minnesota Historical Society, the Minnesota State Arts Board and the Minnesota Humanities Center will host a series of listening sessions to obtain public input for a 10-year plan and 25-year framework for the use of funds made available through the Arts and Cultural Heritage Fund. The constitutional amendment, approved by voters in November 2008, added a provision to Minnesota’s constitution that provides for an increase in the sales tax to support outdoor heritage, clean water, parks and trails, as well as arts, history and cultural heritage. Representatives from the three organizations and 10 other history, arts and cultural organizations and libraries will work together to develop a plan for how proceeds of the Arts and Cultural Heritage Fund will be spent. Members of the public are encouraged to attend. Listening sessions will be held in coming months in locations across the state. An online survey is available. 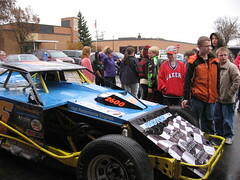 The results of this collaborative planning process will be reported to the legislature by Jan. 15, 2010. Time: 5 – 7 p.m. The public is encouraged to arrive at 5 p.m.
October 29 at the Fergus Falls Center for the Arts , 124 W. Lincoln Ave.
November 16 at the Rochester Community and Technical College , Heinz Center, 851 30th Ave. S.E. If you can’t attend a listening session, please provide your input via an online survey. The 13-member committee was chosen from a field of 50 applicants nominated by their peers. Pam Perri Weaver, board member, Minnesota State Arts Board. 2. Urge Congress to repeal the USA PATRIOT Act’s expanded National Security Letter Section 505 and Section 215 authorities that allow the FBI to demand information about people who are not targets of an investigation and to reinstate standards limiting the use of these authorities to obtain information only about terrorism suspects and agents of foreign powers. 3. Urge Congress to allow nondisclosure or “gag” orders of limited scope and duration only when necessary to protect national security and only upon the authority of a court, and ensure that targets of such orders have a meaningful right to challenge them before a fair and neutral arbiter. 6. Urge its members, Minnesota librarians, Minnesota library trustees, and all library advocates to ask Congress to restore crucial safeguards protecting civil liberties. 1. Robert S. Mueller. (March 25, 2009). “Oversight of the Federal Bureau of Investigation,” Hearing of the Senate Judiciary Committee. Accessed through LexisNexis Congressional database. Heads up! MLA Foundation mini-grants are available to Minnesota libraries. Application deadline is Dec 31, 2009, for these $500 awards. Click here for the guidelines and application information. This is a great opportunity to seek supplemental funding for that very special project or event! These things that keep Joyce and Doug awake at night are likely to keep most of us awake, no matter what type of library we work in or use. Times are changing — are we? are our libraries? are we up to the challenges or will our profession be eclipsed? There is an urgency to this article that should stimulate wide discussion in our ranks. 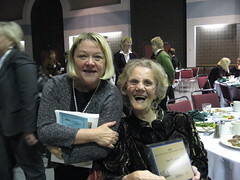 Peg Werner and Joan Larson were both honored at the recent MN Library Association Annual Conference in St Cloud. Peg received the President’s Award from MLA President Ken Behringer for her work on library maintenance of effort across a whole field of players and interested partners. Peg is the Director fo the Viking Library System. Joan Larson received the MN Library Association Distinquished Achievement Award for her years of service in the library community, her passion, enthusiasm, and endless innovation, and her continued voice in retirement. Joan is the former Executive Director of the Northern Lights Library Network , an active member of the Douglas County Friends of the Library in Alexandria, and a member of the Mn Assoc of Library Friends Board. Also honored at the Conference was Senator Dan Skogen of Otter Tail Co for his hard work and successful championing of libraries in the Minnesota Legislature.